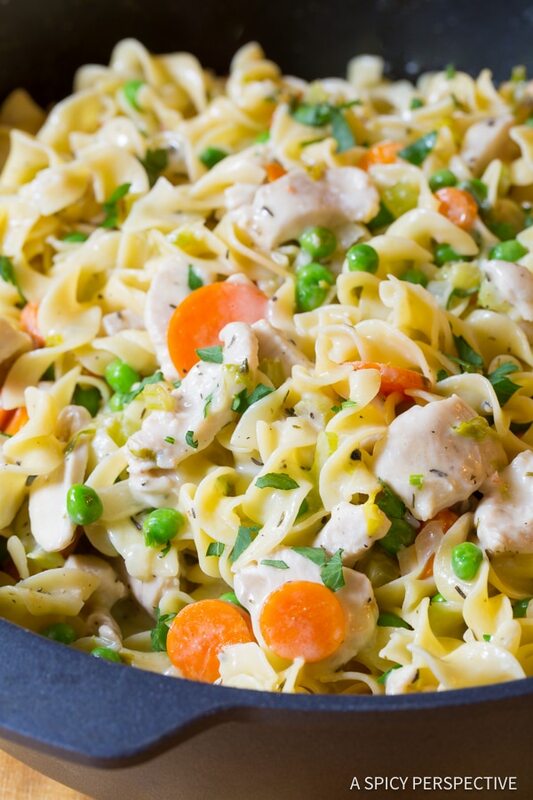 Creamy comforting One-Pot Chicken Noodle Casserole. 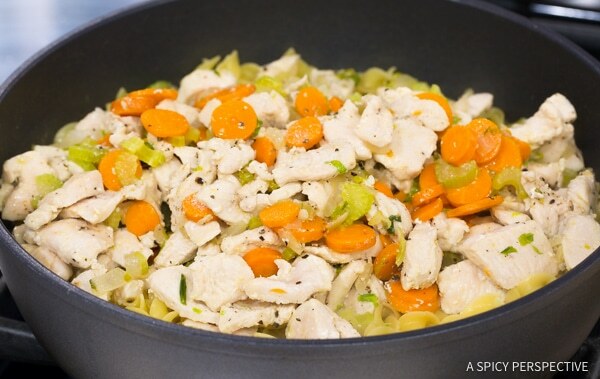 This family meal can be made on the stovetop alone, or popped in the oven for a crispy top! The kids are back in school, or they will be shortly. Summer seems to be coming to an end. Vacation time is over. We crave comfort food, and lots of it. It’s time for pasta dishes, casseroles, and quick cozy mid-week meals we can throw together after a long day at work or school. Isn’t it great that some recipe cover all three categories? 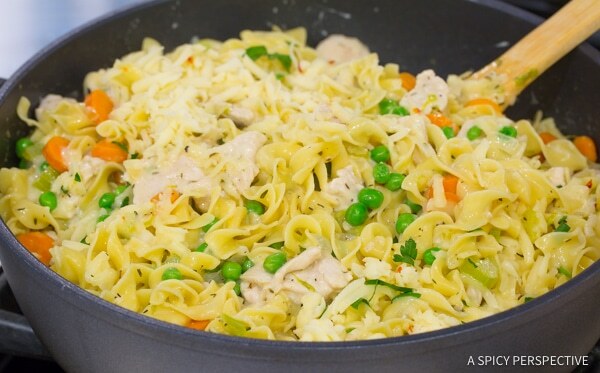 Today’s easy One-Pot Chicken Noodle Casserole offers all the coziness of chicken noodle soup, yet with a rich creamy cheese sauce. It can be made completely on the stovetop in less than 30 minutes. Or if you like a crunchy “casserole top” you can sprinkle breadcrumbs over the pasta and bake it for a few minutes. If you happen to have a large oven-safe saute pan it’s a true one-pot dinner. However you can easily pour the pasta into a baking dish before you pop it in the oven. 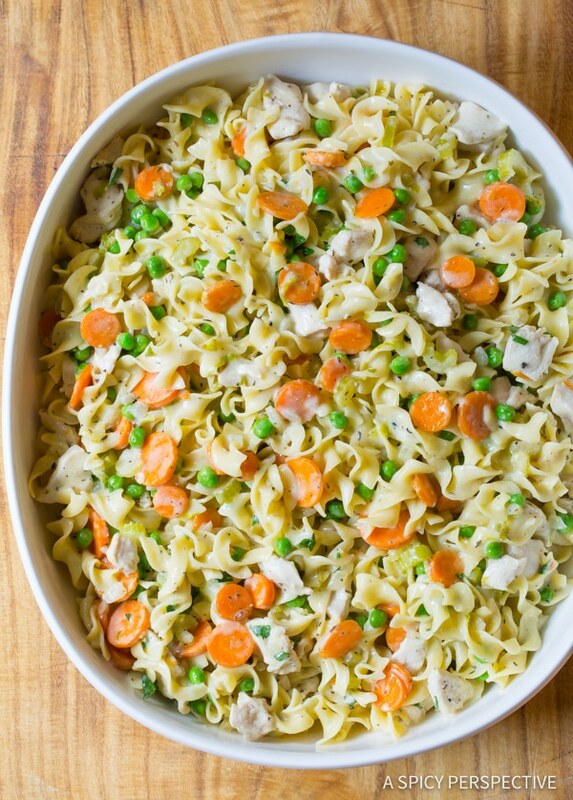 One-Pot Chicken Noodle Casserole it a big hit at our house. If I’m in a hurry I make the stovetop version and serve it loose and saucy. On nights I have a few more minutes, I take the time to bake it so the breadcrumbs and top layer of noodles offer a little crunch. 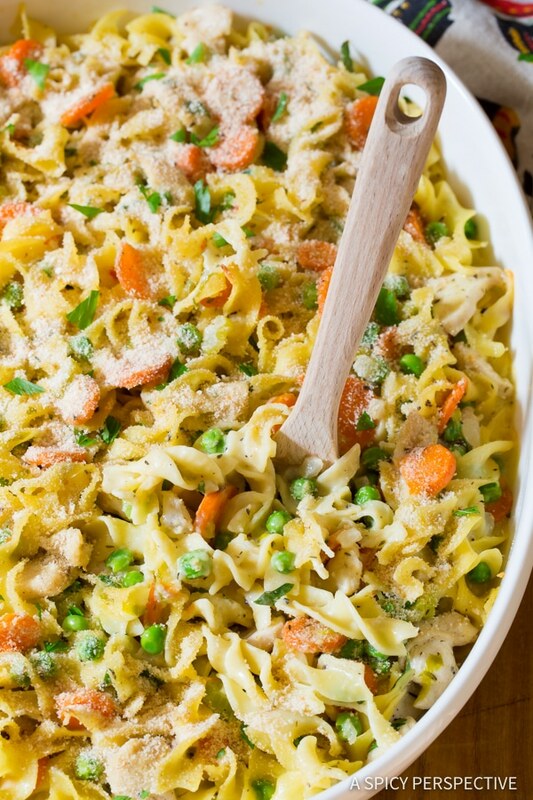 Either way, One-Pot Chicken Noodle Casserole is completely divine! 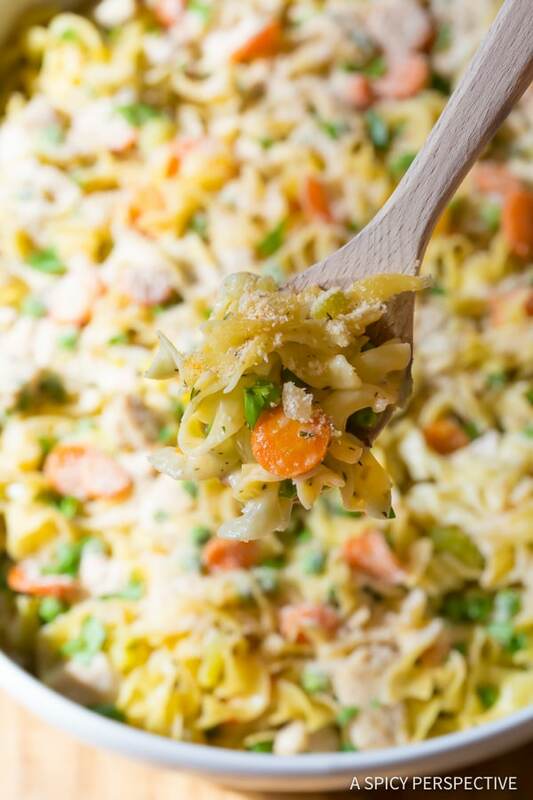 Creamy One-Pot Chicken Noodle Casserole, a comforting meal for the whole family! 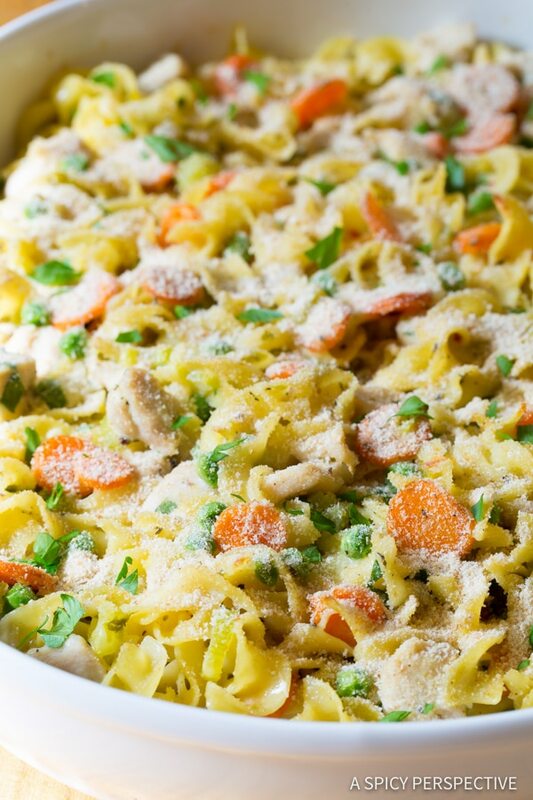 Chicken, veggies, and egg noodles are bathed in a cheesy cream sauce and baked. Place the butter in the large oven safe saute pan and set over medium heat. 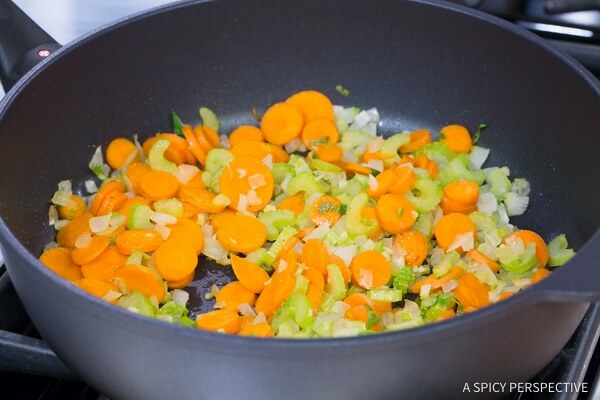 Add the chopped onions, celery, and carrots. Saute for 5-8 minutes to soften. Meanwhile chop the chicken breasts into small bite-size pieces. Once the veggies are softened, add the chicken, salt and thyme. Saute another 5 minutes to cook the chicken pieces partially through. Add the broth and pasta. Stir to soak the pasta. Cover the pan and simmer for 6-7 minutes to cook the pasta through. Then remove the lid and stir in the frozen peas, shredded cheese, and cream. Salt and pepper to taste. 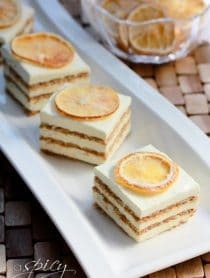 Serve immediately or bake! This step is entirely optional: Preheat the oven to to 350 degrees F. Sprinkle breadcrumbs over the top of the pasta. Bake for 15-20 minutes to develop a crusty top. You can transfer the pasta to a separate baking dish if you don't have an oven-safe saute pan. Hi! I made this tonight…. soooo delicous! Thank you so much! I subbed fresh chopped red/green peppers and canned mushrooms for the celery and carrots, since my husband’s not a fan. Worked out great!! Thanks again! I made this last night and it was amazing! I left out the peas because no one in my house will eat peas but me; maybe next time I’ll toss in some chopped broccoli for the color though. 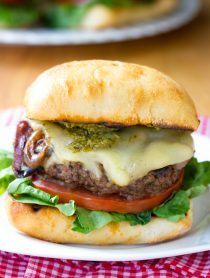 This was super easy, fast, and so delicious! It will be even better this winter on a cold night. Love love love it! 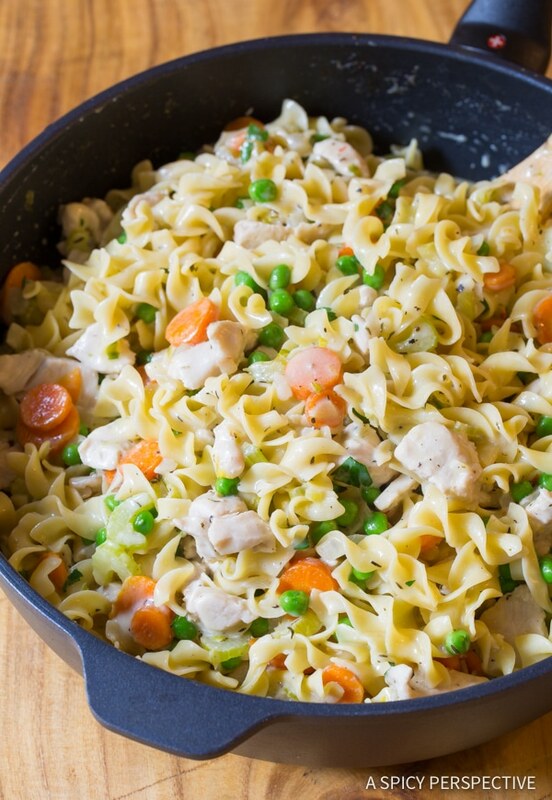 One pot meals truly make life so much easier! Looks so good! total comfort food! looks delicious! Im a big fan of one pot meals! Now it just needs to get a bit cooler so I can enjoy this dish without sweating. Looks delicious! I really like that this dish can be stove top or baked. Versatile meals are always wonderful! Great looking meal! This sound nice and easy! What a perfect weeknight meal. My kiddos will LOVE this! Sommer, this looks so good! I love egg noodles. Such a great recipe for back to school!! My inner five year-old just jumped for joy!! 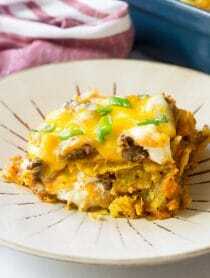 So much yes in this casserole!! What a great back to school recipe!